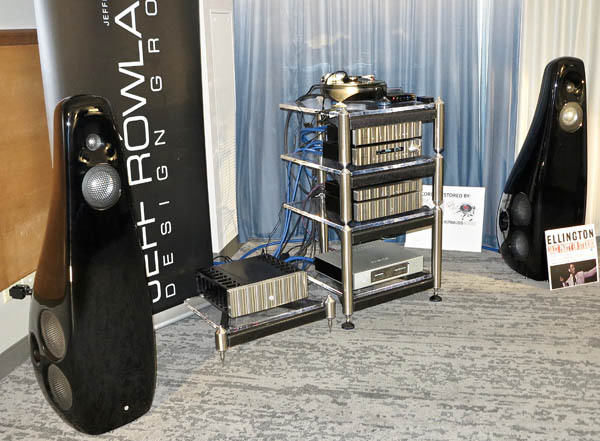 This time, it wasn’t Rowland’s integrated, but instead the Jeff Rowland Model 625 S2 Stereo Amplifier ($15,900), Corus Stereo Preamplifier ($14,900), PSU Power Storage Unit ($8200), Aeric DAC ($9800), and Conductor Phono Preamplifier. It was also my first listen—a very happy one, I might add—to Vivid’s unusually shaped Kaya K90 Loudspeakers ($26,000/pair). I’m quite familiar with the Grand Prix four-shelf Monaco Isolation System ($10,250) and Amplifier Isolation System ($3150), which I have at home, but I had to take my hat off to the Grand Prix Monaco V2 turntable ($37,500) with Tri-planar/Ultimate 2 SE Arm ($7500) and Lyra Etna Cartridge ($10,000). I didn’t hear the Aurender N10 ($8000), on which I’ve written a follow-up, because my experience was, once again, all vinyl. On that score, a lively track from Columbia’s Ellington Jazz Party in Stereo had me tapping my foot, while some stultifyingly staid ballet music had me admiring its lovely warm middle (ahem), even as it left me wondering if I would have enjoyed it more had I dyed my hair silver blue. But for folks who love that sort of thing—perfect background for high tea in the parlour, I must say—it sounded just lovely.